Transform your space into a Tuscan-inspired expanse with this honed travertine floor and wall tile. 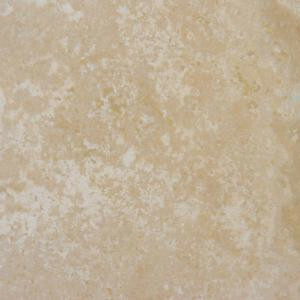 Tuscany Beige 12 in. x 12 in. tiles from MS International have a beautiful natural stone pattern to make your setting unique and varied, while the neutral color and low sheen coordinate with any design aesthetic. Hearty enough to withstand sub-freezing temperatures outside and versatile enough to work with an under-floor heating system inside, this elegant tile is a splendid choice for any commercial or residential flooring project. It's also a stylish tiling option for backsplashes, countertops, shower walls and fireplace facades. NOTE: Inspect all tiles before installation. Natural stone products inherently lack uniformity and are subject to variation in color, shade, finish, etc. It is recommended to blend tiles from different boxes when installing. Natural stones may be characterized by dry seams and pits that are often filled. The filling can work its way out and it may be necessary to refill these voids as part of a normal maintenance procedure. All natural stone products should be sealed with a penetrating sealer. After installation, vendor disclaims any liabilities. Buy online MS International Tuscany Beige 12 in. x 12 in. Honed Travertine Floor and Wall Tile (10 sq. ft. / case) TTBEI1212, leave review and share Your friends.